This interview is filled with amazing information relevant to your health! It is excerpted from a TV documentary scheduled to air later in the year, with Dean Neuls, founder of AlgaeCal Inc.
Q: How serious is the Osteoporosis problem in America? Dean: The US Surgeon General in 2005 warns that by 2020, ½ of people over 50 will be at risk for osteoporotic fractures! Not osteoporosis, but worse than that – fractures! America is one of the top sufferers from Osteoporosis in the world. Picture in your mind some people you know in their 80’s and 90’s. Everyone we know at that age has lost stature – in most cases several inches, and many have developed the typical humped back and that comes from de-mineralized bone and spinal fractures. Osteoporosis is called the “Silent Disease” because most people don’t know they have it until they get a fracture. It’s not so silent when you have fractured hips or you’re all hunched over with fractured vertebrae. According to the Surgeon General, in decades to come, it will happen to you and I in our 50s and 60s if we don’t take preventative action! Q: What is causing this osteoporosis epidemic? Dean: There are several contributors to osteoporosis so I can’t categorically point to just one factor, but I think one of the key contributors is pretty well documented. From 1982 -1986 the US Food and Drug Administration conducted what they called the “Total Diet Study” in which they found Calcium, Magnesium and several other minerals were deficient in several ages and gender groups. In 1996 the USDA completed it’s “Continuing Survey of Food Intakes of Individuals” corroborated the FDA’s study. The USDA found both boys and girls, men and women deficient in Calcium. I think the most shocking statistic is for teen girls – 87% do not get recommended intakes of calcium. I could quote the Centers for Disease Control, the World Health Organization and others who are also warning that we need to supplement with Calcium. Q: So we have the Surgeon General, the FDA, the USDA, the CDC, the WHO – are their ANY governmental bodies that are not warning us about this tragic disease? Dean: I think the Department of Defense is the only one that hasn’t issued an osteoporosis or mineral deficiency warning! But listen to this. Recent clinical studies show if you supplement to build bone as children, it’s like depositing “money in the bank” for your old age. Bone loss is inevitable for women and men as we age, but if you started out with a large account it sure helps later in life. In other words, Osteoporosis is largely preventable! You can help your children minimize their risk, and the AlgaeCal Bone Health Program supports bone health at any age. Q: Tell us about the calcium supplements we are currently taking? Is there a problem we should be aware of? Dean: If you are taking calcium supplements, and you should be, you are either taking an inorganic or a laboratory-made calcium. All calcium supplements you find on the store shelves today are either inorganic – for example calcium carbonate, or they are laboratory made calcium like calcium citrate. The majority of calcium supplements, probably including the one in your cabinet, are calcium carbonate. Q: So what’s the problem with calcium carbonate? Dean: Well, it’s rock. Limestone to be specific. Blackboard chalk is limestone. You buy it in bags for fertilizing your garden. Rock is great for your garden where plants can break it into a more useful form, but not the best for eating directly. It’s better than nothing that’s for sure, but there are much better options today. We’re designed to eat plants that have “pre-digested” the minerals in the soil. Trouble is, all the plants we are familiar with have too little calcium to be practical. Q: What about Absorption? I hear calcium is poorly absorbed? Dean: Let’s suppose you and I go into business together producing Calcium supplements. We buy some low cost raw calcium – probably carbonate. We buy a tablet press so we can apply tremendous heat and pressure. We add glue to keep the tablet in the shape. In fact, 50% of our product will be a glue, like povadone or sugar, plus flowing agents like magnesium stearate or calcium stearate. We have standard sized molds, so fillers and excipients will probably be used too. We want to maximize shelf life by keeping moisture out, so a wax or shellac coating like hydroxypropylmethylcellulose will be applied as a sealent. Congratulations! Now we have a cheap form of calcium with limited bio-availability which is then further insulted with heat, pressure, glue, additives, and shellac. The PDR (physicians desk reference) says “supplements in tablet or pill form are only 10% absorbed by the body” – as a rule of thumb – some will be better, some worse. If you have been spending $20 on calcium supplements, $18 is flushed down the toilet. Q: Ok, what is the AlgaeCal Bone Health Program? Dean: Exactly what is being done in the clinical study. Supplement with AlgaeCal, Vitamins D3 and K2, plus Strontium Citrate. Then we have the study participants using a pedometer to measure their walking exercise to encourage more weight bearing exercise. 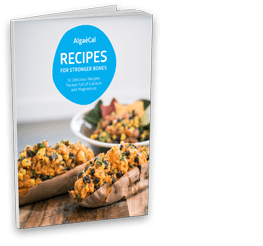 Q: What will AlgaeCal Plus do for my bones? Dean: AlgaeCal Plus with Strontium BoostTM is exactly the same formula as used in the clinical study testing bone growth. Our pre-clinical research on the ingredients make us believe it will be proven as the best bone growth formula ever. For example, little known in America is the Japanese studies on Vitamin K2 which are showing strong bone growth. Strontium is another “secret weapon” for bone growth. In France, Phase 3 FDA Studies have been completed showing very exciting results. We are the first company to take all the latest researched bone health ingredients and combine them with the world’s only plant-sourced calcium. Q: What Will AlgaeCal do for my general health? Dean: Think about your biggest health problem right now. What is it? Sore back? Achy joints? Allergies, headaches, skin problems, elimination problems, stomach problems. Maybe you’re just tired all the time, or you get PMS really badly, or you can’t sleep. It may be your bodies cry for minerals. AlgaeCal does not cure any disease. It simply provides your body with the building blocks that are needed for healthy tissues. Q: What is the most important mineral for humans? Dean: The one that’s missing! When you buy a calcium supplement from the store, you are not getting any trace minerals. AlgaeCal provides ALL 13 known essential bone supporting minerals; calcium, magnesium, boron, copper, manganese, silicon, nickel, selenium, strontium, phosphorus, postassium, vanadium, and zinc – and they are pre-digested plant minerals. Q: How does AlgaeCal compare to Coral Calcium? Dean: Coral is an animal and Algae is a plant to begin with. All coral has been dead for many years when it is harvested and then heat treated. When high heat is applied to organic matter, all carbon based structures such as enzymes, essential fatty acids, and phytonutrients are burned up. Both above-sea and marine grade coral have been heat treated. AlgaeCal is harvested live so it has all the nutrition possible in a sea plant, then it is cold processed to retain it. The result is 12 times more trace minerals per gram than any coral calcium products! Q: Why should one be excited about finding out there are 12 times more trace minerals in AlgaeCal than any of the coral calciums? Dean: Our soil is depleted with the advent of agri-business. Each year for decades now, crops are planted and the roots pull 70 minerals from the soil, but the fertilizers only put 3 minerals back into the soil (NPK – nitrogen, phosphorus, and potassium. Like your house plant fertilizer 20-20-20). You have over 60 minerals normally in your body. Of the 60 plus minerals circulating in your body, 25 have been ruled as essential. The others are in the “I don’t know category” – they might have some important function or they might not – they just haven’t been studied. Every few years a new mineral is added to the list of essential minerals. Too many of us think we just need calcium or just calcium and magnesium. The truth is you NEED somewhere between 25 and 60 minerals! You’re not getting them from your food. Q: What about my multi-vitamin or my calcium supplement. I’m getting my minerals there right? Dean: You’re definitely not getting them from your calcium supplement unless you’re taking AlgaeCal. If you check the label on your multi-vitamin, you’re not getting a fraction of them there either and the few that are listed are usually in a poorly absorbed form. Q: I understand farmers find health benefits when supplementing their cattle with trace minerals. We humans eat from the same mineral depleted fields. Should we be taking a lesson from that? Dean: Many trace minerals have become entirely absent in the land growing feed for their cattle so farmers have begun supplementing their beef and dairy herds because it makes economic sense – it’s more profitable to buy trace mineral supplements and feed it to their cows than to suffer losses from trace mineral deficiency diseases. One interesting study showed heifers on trace mineral programs produced 3.7 pounds per day more milk compared to non-supplemented groups, conception rates improved significantly, weaning weights in calves were higher and overall herd health improved according to one study (Feedlot, Volume 8, number 2, March 2000). Farmers find it cost effective to buy trace minerals and add it to animals’ foods because the animals are not getting these elements from the produce of the fields. We humans eat crops from those same depleted fields and yet many of us don’t think about supplementing ourselves. No wonder we’re suffering! Q: Any other interesting animal studies? Dean: Not only cattle benefit from adding trace minerals to their diets. A two year study raising meat chickens using an animal grade AlgaeCal compared to birds on growth hormone was conducted at University of Vila Velha. The result showed similar growth rates, but the chickens on AlgaeCal were more energetic and hence produced a leaner, higher protein, lower fat bird3. Now, we’re not saying results in humans should be assumed from animal studies – they should just be regarded as an indicator of possible benefits and further testing on humans is of course necessary. Q: Another popular product from the sea these days is called Sea Vegg. How does AlgaeCal compare? Dean: Sea Vegg looks like a good product, but it has almost no calcium or magnesium which are the #1 and #2 minerals required by your body. If you follow the directions on the AlgaeCal bottle and eat an average diet, you will end up with at least full RDI levels of Calcium and Magnesium. Q: What other uses is AlgaeCal being put to? Dean: AlgaeCal has been surfacing in some pretty unexpected areas lately. Today we have one of the leading wound care specialists using AlgaeCal in his topical wound healing formula – used mostly for bed sores which are the hardest to heal kind of wound. On December 31st 2005 the Daily Mail in London posted an article – one concerned father living in the Netherlands has a son with Autism. He ends up leaving his profession and becomes a full time nutritional researcher. His son is making significant improvements using several formulas which include AlgaeCal. Now he has passed the formulas on to others and some of them seem to be progressing as well. They are now planning a clinical study using these AlgaeCal formulas to study it further. Q: What about weight loss? Does AlgaeCal help with weight loss? Dean: I don’t know. There are two companies experimenting with AlgaeCal right now on weight loss formulas for two different reasons. One company has a very interesting theory about weight loss. They believe the reason we get fat is we eat food which is mineral deficient so we don’t feel satisfied and it results in over-eating. Unfortunately the foods are still full of carbs and fat which packs on fat, but we feel empty and keep on eating. They are supplementing with AlgaeCal to see if people are more satisfied with their food and begin to break the habit of overeating. Q: Some Doctors believe a key to good health is keeping the cells in your body alkaline. Does AlgaeCal help raise your pH levels? Dean: If you pour a little AlgaeCal into a glass of vinegar which is an acid with a pH of about 2. There is a visible chemical reaction as the AlgaeCal takes the pH up about 4 points to a 6. That represents a 4000% increase because each point on a pH scale is 10 times greater.